Below is a list of over 200 cases arranged by condition or type. Click in the headings below to display cases in that category. Capsular Block Syndrome: An Unusual Presentation: 51-year-old pseudophakic female presents with poor vision in the right eye (OD). Fluctuations in vision were first noticed 6 months ago with documented vision as poor as 20/150. She had uneventful cataract surgery 10 years prior with insertion of a Polymethyl methacrylate (PMMA) intraocular lens (IOL) in the capsular bag. Intraoperative Floppy Iris Syndrome: IFIS presents problems during cataract surgeries by decreasing the size of the work field and increasing the rate of complications such as iris trauma, posterior capsule rupture, and vitreous loss. Morgagnian Cataract: 59-year-old female with decreased vision at distance and near, more so in the right eye than the left and iincreasing difficulty with glare from bright lights at night, seeing road signs, watching television, and reading the newspaper. Persistent Fetal Vasculature: 19-year-old female with a history of amblyopia in the right eye (OD) due to persistent fetal vasculature (PFV) presented to the University of Iowa Hospitals and Clinics (UIHC), Department of Ophthalmology to re-establish care. Pembrolizumab (Keytruda®) Induced Uveitis in a Patient with Metastatic Melanoma: 65-year-old male with history of metastatic cutaneous melanoma previously on pembrolizuamb presented to the comprehensive ophthalmology service with blurred vision worse in the left eye for the past 6 months. Posterior Polar Cataract. 38-year-old male with blurry distance vision and problems seeing at night and significant glare from oncoming headlights when driving at night. True Exfoliation Syndrome:84-year-old male presented with gradually worsening blurry vision in both eyes (OU), left worse than right, over a period of several years. Acute Corneal Hydrops: 51-year-old male with keratoconus and history of rigid gas permeable (RGP) contact lens wear in the left eye presented with left eye redness, pain, light sensitivity, and tearing for 1 week. Adenoviral Conjunctivitis: 38-year-old white female with watery, red, irritated eyes; left more than right. Calcific Band Keratopathy. 71-year-old female referred for evaluation of a corneal scar in the right eye (OD). The scar was present 10 years previously when she was evaluated for painless and slowly progressive vision loss. She attributed the scar to a "fan injury" that she experienced at 20 years of age. Over the last ten years, she has experienced further painless vision loss OD. The vision in the left eye (OS) has been excellent. Chandler Syndrome: A subtle presentation. (Iridocorneal endothelial syndrome: Chandler Syndrome variant) Patient initially sought care for migraines with mild headache on the right side of her head and halos around lights through her right eye. An ophthalmologist confirmed the narrow angles and placed her on medications to successfully lower her intraocular pressure. Halos around lights and a mild decreased acuity persisted. Conjunctival Melanoma arising from Primary Acquired Melanosis (PAM): 61-year-old Caucasian female presenting for evaluation of corneal mass OS found on routine exam about 2 months previous. Conjunctival rhinosporidiosis in a temperate climate. 27-year-old male was referred for evaluation of a left medial canthal lesion. The patient first noticed the lesion about one month prior to presentation. Cystinosis: A 12-year-old boy with light sensitivity. Patient had progressive photophobia during outdoor activities. Recently, he became symptomatic indoors. He had intermittent redness and mild foreign body sensation in both eyes. Examination showed the presence of corneal crystals, laboratory testing showed increased levels of leukocyte cystine. Cystinosis: 4-year-old girl with failure to thrive, severe photophobia, and newly diagnosed renal insufficiency. 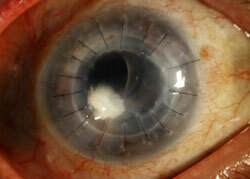 Deep Lamellar Endothelial Keratoplasty (DLEK) for Fuchs: 72-year-old female with Fuchs. Granular Corneal Dystrophy Discovered Following LASIK: A Clinicopathologic Correlation of Granular Corneal Dystrophy Type II and LASIK. 44-year-old male with progressive decrease in vision in both eyes with "tremendous" glare symptoms. Eight years prior to presentation he underwent Laser-assisted in situ keratomileusis (LASIK) in both eyes. Herpes Simplex Keratitis: 36-year-old female presented to the Emergency Treatment Center (ETC) with one day of right eye pain, photophobia and decreased vision. Megalocornea. 60-year-old male with a history of simple megalocornea reported visual disturbance while changing head position, his vision worsened with his head bent down.He previously had cataract surgery with an iris-sutured IOL. Ocular Manifestations of Stevens-Johnson Syndrome: 13-year-old female treated with trimethoprim-sulfamethoxazole developed mucosal and dermatologic eruptions with ocular involvement. Perioperative Corneal Abrasions: Systems-based review and analysis. 64-year-old male patient noted severe pain in his right eye while in the post-anesthesia care unit shortly after laparoscopic surgery. A bedside ocular examination was remarkable for a linear, horizontal corneal epithelial defect. Peters Anomaly: 2-day-old infant evaluated for bilateral corneal opacity noted at the time of delivery. There were no known maternal infections during the pregnancy and no problems during the perinatal period. The infant did not show evidence of tearing, blepharospasm, photophobia, drainage, or ocular redness. Phakic intraocular lenses for high myopia: A 24-year-old male with unilateral high myopia presented with anisometropia (unequal refractive error between the eyes) with aniseikonia (binocular differences in image size) and a large right sensory exotropia. His primary concerns were the cosmetic effect of his exotropia and the intolerable double vision and aniseikonia he experienced when his "bad eye decided to work." He wore spectacles with the right eye under-corrected to minimize his symptoms. He did not tolerate contact lenses and was interested in surgical options. Posterior Polymorphous Corneal Dystrophy (PPMD). 3-year-old male who was referred to the cornea clinic after failing a KidSight screening and was found to have bilateral corneal opacities when evaluated by his optometrist. He had bilateral, diffuse, geographic-shaped, discrete, gray lesions at the level of Descemet's membrane. Pseudophakic Bullous Keratopathy: Deep Lamellar Endothelial Keratoplasty (DLEK) and Intraocular Lens (IOL) exchange with Anterior Vitrectomy. Post LASIK Ectasia: Female patient presented status post bilateral LASIK for myopia. Vision in the right eye was progressively more blurred. Salzmann's Nodular Corneal Degeneration: 62-year-old woman presents with 3 years of progressive decrease in vision. She has had 3 updates of her spectacle prescription that have not provided satisfactory vision. Superior Limbic Keratitis: A 63-year-old male presents for evaluation of irritation and injection of both eyes, that is refractory to management with lubrication. Thygeson's Superficial Punctate Keratitis: A 23-year-Caucasian male presents with bilateral photophobia, foreign body sensation, and tearing that is worse in the left eye. Use of Ophthalmic Medications in Pregnancy: A 19-year-old pregnant woman at 19 weeks gestation was referred for evaluation and treatment of suspected Acanthamoeba keratitis. Verticillata: 54-year-old white male with a known history of atrial fibrillation and hypertension on amiodarone. Vision Loss After Contact Lens-Related Pseudomonas Keratitis. Since the majority of cases of microbial keratitis (mk) in contact lens wearers are due to Pseudomonas, and this specific infection heralds a worse prognosis, we investigated outcomes at our facility to determine the frequency and extent of visual loss in cases of Pseudomonas keratitis occurring in eyes with previously normal visual acuity and no risk factors for MK except contact lens wear. Best Vitelliform Macular Dystrophy: 30-year-old female referred for bilateral macular lesions. Homocystinuria: 18-year-old male presented to clinic for regular monitoring of ocular manifestations of methionine synthase deficiency type homocystinuria, specifically cobalamin deficiency of the Cb1G subtype. Pattern Dystrophy Associated with Myotonic Dystrophy: 56-year-old female presented with a one-year history of increasingly distorted vision OS described as "crinkled"
Aphakic Glaucoma: 5-year-old female was referred to the University of Iowa Hospitals and Clinics (UIHC) Glaucoma Clinic for evaluation of suspected aphakic glaucoma of the left eye (OS). Bilateral sequential aqueous misdirection: an overview of medical and surgical management: 50-year-old Caucasian woman was referred to the University of Iowa Glaucoma Service for evaluation of ocular hypertension and anatomically narrow angles in both eyes. Cogan-Reese Syndrome: A Rare Case of Unilateral Glaucoma: 69-year-old woman presented to the University of Iowa Hospitals and Clinics (UIHC) glaucoma clinic for evaluation of decreased vision in the left eye (OS) in the setting of elevated intraocular pressure (IOP) OS. Giant reservoir formation from Ahmed seton valve: A 79-year-old man presenting for treatment of a chalazion on the left eye and follow-up care of his right anophthalmic socket. His wife mentioned that he exhibits a right head turn while watching television. Grant syndrome (Syndrome of precipitates on the trabecular meshwork): 60-year-old male referred for evaluation of elevated intraocular pressure (IOP), right eye with corneal edema. Treated with a laser peripheral iridotomy and started on bimatoprost and brimonidine/timolol. The only pertinent exam findings were pigmented precipitates on the anterior trabecular meshwork OD on gonioscopy. Hypotony: Late hypotony from trabeculectomy and Ahmed seton with resulting hypotony maculopathy: A 36-year old female presented with poor vision secondary to a low intraocular pressure (IOP) in her right eye. Iridocorneal Endothelial Syndrome (ICE) - essential iris atrophy: 63-year-old female with PAS, "iris mass", corectopia, and increased IOP OS. Melanocytoma of the Iris and Ciliary Body: 14-year-old male with a pigmented iris lesion of the left eye noticed on routine eye exam approximately two years earlier. Higher power magnification showed elevation of lesion with mildly irregular surface without surface vessels and the iris central to the lesion pushed into folds. Posner-Schlossman Syndrome: 63-year-old male was evaluated on an urgent basis for pain, redness, and "elevated eye pressure" in the left eye (OS). Pseudoexfoliation Glaucoma: 65-year-old male with complaints of painless, gradual loss of vision OS. Refractory Primary Open-Angle Glaucoma Treated with Ab Interno Canaloplasty (ABiC): A 59-year-old male presented with a history of Granulomatosis with Polyangiitis (GPA) - formerly known as Wegener's Granulomatosis, medically-uncontrolled primary open angle glaucoma (POAG), and pathologic myopia. Secondary Open-Angle Glaucoma Treated with Gonioscopy-Assisted Transluminal Trabeculotomy (GATT). A 20-year-old female was referred for management of secondary open-angle glaucoma. 3 years prior she had been diagnosed with an unusual vasoproliferative tumor in her left eye. Shortly after treatment with intravitreal steroids and photodynamic therapy, her IOP spiked to 59 mm Hg. Seton Infection: Serratia Marcescens: 57-year-old white female with 1 day history of redness, swelling, and pain in her right eye. Sturge-Weber Syndrome: 4-year-old child with a history of seizures and glaucoma. Topiramate-Induced Angle Closure: 29-year-old woman presented with bilateral blurry vision and headache. Several hours prior to presentation, she noted a progressive decrease in distance vision that limited her ability to read the whiteboard across the room. Opsoclonus-Myoclonus Syndrome Secondary to West Nile Encephalitis: A 52-year-old man with a history of degenerative joint disease, migraines, and viral encephalitis 15 years prior presented to the Emergency Department with two weeks of progressive back pain, maculopapular rash, fever, night sweats, headache, and photophobia following a trip to Indiana. Acute Demyelinating Encephalomyelitis (ADEM) with associated optic neuritis: 9-year-old girl presents to an outside hospital with fatigue, poor appetite, and decreased activity for 3 weeks. All-trans retinoic acid (ATRA) induced intracranial hypertension in a patient with acute promyelocytic leukemia: 19-year-old male ungergoing ATRA and Idarubicin induction therapy for APL with one-week complaint of intermittent headaches and transient visual obscurations. ANCA-associated granulomatous vasculitis (Wegener's granulomatosis): 54-year-old male with binocular vertical diplopia 4 months prior to presentation and progressively worsening. Vision in the right eye was starting to "darken." Prior to presentation, patient was followed by an otolaryngologist for his sinus disease and nosebleeds. Cavernous Sinus Syndrome Secondary to Pituitary Apoplexy: 38-year-old woman developed a headache across the forehead and behind the left eye that began five days prior to presentation. Cranial Nerve IV (Trochlear Nerve) Palsy: 57-year-old male complaining of vertical diplopia after head trauma. Dorsal Midbrain Syndrome (Parinaud's Syndrome) with Bilateral Superior Oblique Palsy: 43-year-old male referred for evaluation of binocular diplopia. Dramatic Visual Recovery in Untreated Indirect Traumatic Optic Neuropathy: Severe vision loss in one eye immediately after motorcycle accident. Facial Nerve Palsy: Ocular Complications and Management. 72-year-old male with left lower eyelid retraction in left facial nerve palsy secondary to metastatic lymphoma and radiation therapy. This case features 11 oculoplastic surgery videos. Functional Visual Loss: 37-year-old male with decreased vision progressively worsening over the past year. The patient was referred because he could not read any of the letters on the chart and showed no improvement with refraction. Horner's Syndrome (due to Cluster Headache): 46-year-old male presenting with HA and ptosis. Idiopathic Intracranial Hypertension (Pseudotumor Cerebri): 31-year-old obese female presenting with a history of headaches and transient visual obscurations for six months. Idiopathic Orbital Myositis: A Treatment Algorithm: 19-year-old female who presents with a one-week history of headache, one day of left "eye swelling," and pain that is worse with eye movement. Internuclear Ophthalmoplegia: 40-year-old man presented to the emergency room complaining of acute onset blurry vision through his left eye (OS). Myasthenia Gravis: 32-year-old female with progressive LUL ptosis for several years. Neurofibromatosis Type 1 - Optic Nerve Glioma: 8-year-old white female with acute awareness of complete vision loss, left eye. Nutritional Optic Neuropathy: 28-year-old man who first noticed visual changes one year prior to presentation. Optic Neuritis: A 40-year-old female noticed visual loss in her right eye accompanied by pain with eye movements and a dull retro-orbital ache, two weeks prior to her clinic visit. She also noted decreased perception of color and contrast. Parkinson's disease: a review of the ophthalmological features: 67-year-old man presented to the strabismus clinic with increased difficulty reading for the past year. He experienced intermittent, horizontal, binocular diplopia and blurring of his vision while reading, accompanied by fatigue and headaches. Pituitary Adenoma Causing Compression of the Optic Chiasm: 49-year-old white female with painless progressive vision loss. Posterior Ischemic Optic Neuropathy: 64-year-old male admitted to the intensive care unit following a spinal surgery reporting profoundly decreased vision in both eyes upon waking the following morning. His corrective lenses did not improve his vision. Recurrent Neuroretinitis: 29-year-old white female with progressively worsened vision, right eye, diminished central vision, and pain with eye movements. See-Saw Nystagmus: 64-year-old male who first noted the onset of oscillopsia five months prior to presentation. Thyroid Eye Disease (Graves' ophthalmopathy): 51-year-old male seen in consultation from the internal medicine service for evaluation and management of "dry and red eyes. Successive Presentation of Arteritic and Non-arteritic Anterior Ischemic Optic Neuropathy: 84-year-old gentleman was referred to the Veteran's Affairs eye clinic for a temporal artery biopsy in the setting of possible giant cell arteritis (GCA). Unilateral Optic Nerve Hypoplasia in a patient desiring surgical treatment for exotropia. 17-year-old male with a longstanding sensory left exotropiainquiring about strabismus surgery. Adenoid cystic carcinoma lacrimal gland: 99-year-old patient presented to the oculoplastics clinic with double vision, left proptosis, and decreased vision on the left, which had progressed slowly over the last year. Basal Cell Carcinoma, Morpheaform subtype: 78-year-old male with complaints of enlarging Left Lower Lid lesion. Bell's Palsy Treated with Facial Nerve Decompression: 68-year-old man presented to the eye clinic with five days of right-sided facial droop, which was associated with the inability to fully close the right eye and slurred speech. Bilateral Nasolacrimal Duct Obstruction after Adjuvant I-131 for Thyroid Cancer: 53-year-old female with bilateral tearing worsening over the preceding year. She describes tears that run down the front of her face and denies any ocular irritation. Blepharospasm and Apraxia of Eyelid opening: "I Can't Open My Eyes": 72-year-old man with increasingly frequent difficulty opening his eyes, hw was also bothered by frequent contractions of the muscles around the eyes on both sides of his face which caused forcible eyelid closure. Canalicular Laceration - Dog Bite: 5-year-old white female presenting with dog bite to left side of face. Carotid Cavernous Fistula: 46-year-old female patient presented twith double vision and visual distortion. Dermoid Cyst: 6 month-old male was referred by his pediatrician for evaluation of a right upper eyelid mass. Distichiasis: 64-year-old white male with bilateral eye irritation. Enophthalmos Secondary to Metastatic Breast Cancer. 63-year-old female presenting with progressive double vision and a droopy right eyelid. Enucleation and Evisceration: What to Expect: This guide is intended to provide education about eye removal to patients and families who are considering or undergoing eye removal surgery. Fibrous Dysplasia: 43-year-old female was referred to the University of Iowa Oculoplastics Clinic by her comprehensive ophthalmologist for the evaluation of worsening right-sided proptosis. Floppy Eyelid Syndrome. Two cases illustrating the presenting symptoms and comorbidities associated with floppy eyelid syndrome. Giant reservoir formation from Ahmed seton valve. A 79-year-old man presenting for treatment of a chalazion on the left eye and follow-up care of his right anophthalmic socket. His wife mentioned that he exhibits a right head turn while watching television. Involutional ectropion: Options for surgical management of ectropion. A 72-year-old male presents with epiphora of the left eye, present for one year, worsening over the last month. Also experiencing a foreign body sensation in both eyes and redness along the left lower eyelid. Involutional entropion: options for surgical management of entropion. A 67 year-old male presents with irritation and "scratchiness" of the right eye. His symptoms have been present for the past 8 months and have been only partially relieved with artificial tears and lubricating ointment at night. Localized Orbital Amyloidosis Presenting as New-Onset Diplopia: 45-year-old woman with an unremarkable medical history developed sudden painless onset of horizontal diplopia while driving and noticed her right eye (OD) turning inwards. Lymphoma, Orbital. 60-year-old male who was evaluated 1 wk ago for "conjunctivitis" left eye by internal medicine. Meningiomas. a case and review. A 36-year-old female presented with a "bulging" and apparently swollen left eye noticed about one month prior to her visit. Multiple endocrine neoplasia type 2B: A 27-year-old male presents with multiple eyelid lesions. This patient, with a history of multiple endocrine neoplasia type 2B (MEN2B) was referred by his oncologist for a large lesion on the outer corner of his right eye. Myeloid Sarcoma: 20-year-old female with a history of intermittent binocular diplopia that worsened with right head tilt and a six week history of progressive fullness of the right upper eyelid. Medical History is notable for Acute Myelogenous Leukemia reported to be in remission. Spontaneous Retrobulbar Hemorrhage with Subsequent Orbital Compartment Syndrome. 80-year-old male presented with diplopia and proptosis of right eye. Complained of sudden vision loss in the right eye. Symptoms began that morning with diplopia when he left home to walk his dog. By the time he returned home, he had profound vision loss and right eye protruding. Orbital Lymphatic Malformation (Lymphangioma): 5 year-old female complained of an intermittent frontal headache. Over the next 2 days, she began having daily episodes of emesis and her parents noticed "bulging of her left eye." She was taken to the emergency room where an MRI was performed and demonstrated a left orbital lesion extending into the superior orbital fissure. Periorbital Necrotizing Fasciitis. 87-year-old female with orbital cellulitis resistant to broad-spectrum antibiotics was referred to UIHC. CT imaging which showed fat stranding in the retrobulbar space as well as proptosis of the right eye. Initial cultures from her blood and periocular drainage grew group A beta-hemolytic streptococci. Pan-endophthalmitis and Orbital Cellulitis: 89-year-old female with a history of gradual redness and proptosis, right eye over 3 weeks. Punctal and Canalicular stenosis (dacryostenosis) from Docetaxel: 38-year-old female with persisting tearing for 6 months. Secondary Tumors After Hereditary Retinoblastoma: A Case of Orbital Leiomyosarcoma 50 Years After Initial Enucleation and Radiation Therapy..
Self-Resolving Ischemic Third Nerve Palsy: 62-year-old man with a history of hypertension, hyperlipidemia, and poorly controlled type 2 diabetes mellitus was referred to the University of Iowa Hospitals and Clinics oculoplastics service for evaluation of a drooping right upper eyelid. Silent Brain Syndrome: 32-year-old male with history of excess tearing in both eyes with mucous-like yellowish discharge. Excess tearing henders vision. Anisometropic Amblyopia. 5-year-old male with unequal vision. Congenital Ptosis. 7 month-old male patient with drooping of the left upper lid/left upper eyelid ptosis. Holoprosencephaly and Strabismus. Female child presenting to the eye clinic at age 15 months for eye crossing. She had a history of severe hydrocephalus with seizures and alobar holoprosencephaly at birth. Juvenile Idiopathic Arthritis with Associated Bilateral Anterior Uveitis in a Four-year-old Girl. Routine preschool screening found central posterior synechiae in both eyes. Patient was found to have macular edema and was referred to rheumatology for systemic evaluation with suspicion of inflammatory etiology. Non-accommodative Esotropia and Botulinum Toxin Therapy: 7-year-old boy presented with a history of intermittent, alternating eye crossing for one year that had become constant in the past 2 months. Prostaglandin-Associated Periorbitopathy: Progressive glaucoma and periorbital changes. 52-year-old woman presented with elevated intraocular pressure (IOP) and visual fields demonstrating progressive field loss despite maximum tolerated medical therapy. She had gradual periorbital changes consisting of a “sunken appearance” with a larger eyelid opening. Refractive Accommodative Esotropia. 4-year-old boy originally presented to ophthalmologist at 2 years of age with crossed eyes. Discussion of the management of Refractive Accommodative Esotropia. Sagging Eye Syndrome. 77-year-old female with a complaint of intermittent, binocular, horizontal diplopia present for the last six months. Diplopia was only present at distance and no double vision with near tasks. The double vision was worse with lateral gazes in both directions. Acquired Peripheral Retinoschisis: 83-year-old male was referred to our retina clinic for a retinal detachment which was described as close to the macula in his right eye. He was asymptomatic on presentation. Acute Macular Retinopathy: 30-year-old woman presented for evaluation of vision loss in both eyes (OU) in the setting of a newly diagnosed transverse venous sinus thrombosis. Acute Zonal Occult Outer Retinopathy (AZOOR) and Acute Idiopathic Blind Spot Enlargement Syndrome (AIBSE): 34-year-old female awoke with painless loss of vision left eye 3 weeks prior to presentation. Branch Retinal Vein Occlusion: 59-year-old woman who presented with persistently decreased vision in the left eye (OS). Her vision acutely decreased upon wakening one morning five weeks prior to presentation. Cat-Scratch neuroretinitis (Ocular bartonellosis): 44-year-old female with non-specific "blurriness" of vision, left eye. Central Retinal Artery Occlusion (CRAO): 81-year-old white male with sudden, painless vision loss left eye. Choroidal Hemangioma: Central scotoma in the right eye. Patient with reduced vision and oval-shaped central scotoma in the central visual field of the right eye for two months. Full-thickness Macular Hole (FTMH):68-year-old female with a history of non-exudative macular degeneration referred for vision changes. Hydroxychloroquine (Plaquenil) Toxicity: 57-year-old female with bilateral central photopsias for two years. Currently treated with prednisone and methotrexate for Sjogren syndrome and inflammatory arthritis and was previously treated with hydroxychloroquine for 10 years, stopped one year ago. Interferon Retinopathy: 60-year-old male with hepatitis C virus infection presents with new floaters in both eyes. Treated with peginterferon and ribavirin for 6 weeks prior to visit. Polypoidal Choroidal Vasculopathy (PCV): 57-year-old Caucasian male referred for retinal thickening and subretinal fluid in right eye greater than left eye. The patient noted a stable gray spot and visual distortion OD for the previous several weeks. He had stable chronic floaters but no flashes of light, eye pain, or other ocular symptoms. Progression of Proliferative Diabetic Retinopathy During Pregnancy. A woman with type 1 diabetes was evaluated, one week after an otherwise uncomplicated cesarian section, for decreased vision and multiple new floaters in both eyes. Onset of dramatically decreased vision in both eyes began at the time of child delivery. Retinal Artery Macroaneurysm (RAMA): Sudden painless decreased vision in the right eye. Retinal Dialysis: 31-year-old man was referred to the University of Iowa from an outside emergency department after suffering blunt trauma to his right eye. Serpiginous Choroiditis: 60-year-old male with 15 year history of serpiginous choroiditis reports a 2 day history of a new scotoma noticed on Amsler Grid testing of his right eye. Sickle Cell Retinopathy: 18-year-old African-American male with known sickle cell disease is referred to the vitreoretinal service for evaluation of two days of blurry vision and new-onset floaters in the left eye that developed while playing basketball. Valsalva Retinopathy: Vision loss after asthma attack: 32-year-old female patient presented with a "black spot" in the vision of her left eye. Vascular Tufts of the Pupillary Margin: 68-year-old female presented to the retina clinic with a history of recurrent hyphema in both eyes (OU). She had multiple instances of spontaneous, non-traumatic hyphema for which she had eventually sought medical attention. Vitreous Syneresis: An Impending Posterior Vitreous Detachment (PVD): 60 year-old female with newly reported flashing lights and "large and stringy" floaters in the left eye. Vogt-Koyanagi-Harada (VKH) Disease: 44-year-old Vietnamese woman presented to the emergency department with a 10-day history of progressive blurry vision in both eyes and a three-day history of severe headaches. Waldenstrom Macroglobulinema-Associated Retinopathy: A 61 year-old male presenting with worsening vision in both eyes over the past 2 years, poorly controlled diabetes, persistent DME, and proliferative diabetic retinopathy. Minocycline-Induced Hyperpigmentation. 69-year-old male complaining of chronic, progressive blue-black, painless hyperpigmentation of bilateral lower extremities in the setting of chronic lower extremity venous stasis and long-term, minocycline use for meibomian gland dysfunction and blepharitis. TTP-HUS: 29-year-old male with HA, hematuria, and visual obscurations. Firework-Related Ocular Injuries: 48-year-old male presented July 4th with a firework injury to his left eye which when the patient leaned over a firework that had malfunctioned. The firework launched and directly contacted the left orbit. The patient experienced severe eye pain and had immediate loss of vision in the left eye (OS). Bilateral Diffuse Uveal Melanocytic Proliferation (BDUMP): 89-year-old male presents with multiple choroidal nevi, both eyes. Cholesterol Granuloma: 38-year-old male was referred to the University of Iowa oculoplastics service for evaluation of a right orbital mass. Fungal Endophthalmitis: Hematogenous seeding in an immune suppressed patient with positive fungal and bacterial blood cultures. Iris Melanoma: 47-year-old male referred in 1997 for evaluation of iris lesion OS. Leiomyosarcoma: 53-year-old male with a bump along his left upper eyelid accompanied by mild discharge, but no pain, duration of one month. Patient's ocular history is significant for bilateral retinoblastoma diagnosed at the age of 2 years, at which time he underwent bilateral enucleation followed by 6 weeks of radiation. Lymphoma, Orbital: 60-year-old male who was evaluated 1 wk ago for "conjunctivitis" OS by internal medicine. Meningiomas: a case and review. A 36-year-old female presented with a "bulging" and apparently swollen left eye noticed about one month prior to her visit. Orbital Osteoma: 20-year-old female with a 9-month history of left upper lid droopiness. TB Uveitis: 48-year-old A female with complaint of photophobia, tearing, and eye pain in both eyes. Tubulointerstitial Nephritis and Uveitis Syndrome (TINU): This 18-year-old female presented with a four month history of foggy vision, floaters, and eye redness/irritation in both eyes (OU). She developed mild light sensitivity in both eyes as well as mild, circumferential headaches during the four months leading up to ophthalmologic evaluation. Carotid Cavernous Fistula: 46-year-old female patient presented to the Oculoplastics Clinic reporting double vision and visual distortion. Author. Title. EyeRounds.org. date posted; Available from: http://www.eyerounds.org/cases/filename.htm. Presentations made available for review purposes only. Material presented at morning rounds is presented to initiate discussion. Material presented may not be medically proven fact and should not be used to guide treatment. Opinions expressed are not necessarily those of the University of Iowa. The content of the Department of Ophthalmology & Visual Sciences web site is copyright © The University of Iowa. The University of Iowa allows visitors (including health care professionals who wish to distribute materials to patients) to duplicate portions of this site for personal or educational use without seeking permission from the authors. Any other requests to reproduce the content of this website may be submitted via the contact form. Featured Photo: What is the diagnosis? Opsoclonus-Myoclonus Syndrome Secondary to West Nile Encephalitis: 52-year-old man with a history of degenerative joint disease, migraines, and viral encephalitis 15 years prior presented to the Emergency Department with two weeks of progressive back pain, maculopapular rash, fever, night sweats, headache, and photophobia following a trip to Indiana. Scleritis: A Case Report and Overview: 78-year-old Caucasian woman presented with a two-week history of severe left eye pain and redness. Infectious Crystalline Keratopathy: 73-year-old male patient presented to the Cornea service with a one-week history of right eye redness and pain.